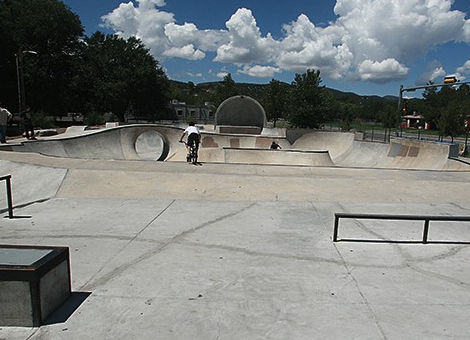 Silver City Skatepark is a 15,000 square-foot all concrete skatepark. It has various bowls, street obstacles and rails. Great for all skill levels! Best of all, it's FREE! Park is unsupervised. Use at your own risk. Users must wear protective equipment. No pipes, ramps, or other unauthorized equipment may be brought into the park. Bikes using the park must have peg guards. Bikes and skateboards may not use the park at the same time. See park hours of operation. Use emergency phone to report problems or accidents. Or call 538-3731.